For individuals with spinal cord injuries, the barriers in living a healthier lifestyle can sometimes be more challenging. Researchers from the Centre for DisAbility Sport Health (DASH) hope to develop new recommendations to help wheelchair users become more physically active. 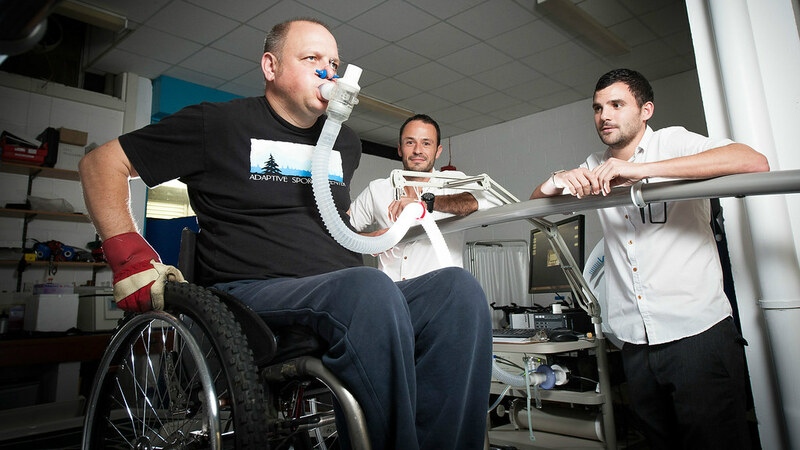 Up to 35,000 people in the UK are affected by spinal cord injuries and estimates suggest that up to three new people a day sustain life-changing injuries. As a result of inactivity for people with such injuries, lifestyle diseases such as Type 2 diabetes and heart disease are more likely to occur and at an earlier age. Now researchers in our Department for Health want to do something about it. They have set out on a new study to investigate the impact of increasing physical activity for people with a spinal cord injury; something they believe could lead to new recommendations with important implications for the health and wellbeing of wheelchair users both in the UK and around the world. As part of a new project, led by the Centre for DisAbility Sport & Health (DASH), researchers want to recruit individuals with a spinal cord injury (between T2 and L5) who are currently inactive for a six week study to measure the impact of regular moderate-intensity exercise carried out at home. Volunteers will be randomly assigned in two groups: a control group and an exercise group, with participants in the control group asked to continue with their normal lifestyle patterns and those in the exercise group asked to complete 4 x 45 minutes of excise each week for six weeks. Participants will be supplied with an ‘arm crank’ to use to complete regular exercise in their own homes. Volunteers taking part in the new study will receive a detailed personal health check, including blood measurements for cholesterol, glucose and insulin, as well as a dietary analysis and measurements for body composition and fitness. In return for taking part they will also receive a £50 voucher. Travel expenses, lunch costs and overnight stays will be reimbursed where necessary. To volunteer to take part please email Tom Nightingale via t.e.nightingale@bath.ac.uk or telephone 01225-384809.